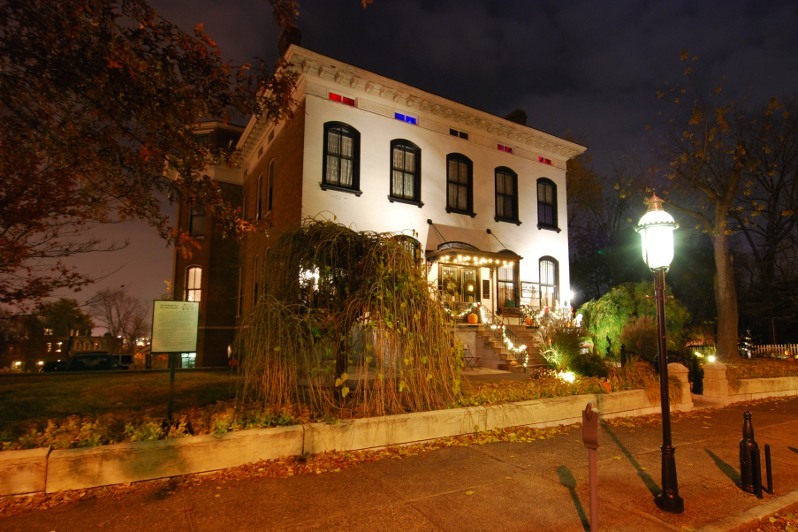 The Lemp Mansion, located in South City near the Anheuser Busch Brewery is considered to be one of the most haunted houses in America. It now functions as a bed & breakfast. I decided to spend the night alone. 1:02 PM: After parking my car, I walk into the mansion to check in. While lunch is technically being served, the entire first floor is empty. After I holler, a well-dressed man walks in from the other room. 1:05 PM: After paying the bill and signing the guest agreement, another man shows me to my room, the Charles Lemp suite. 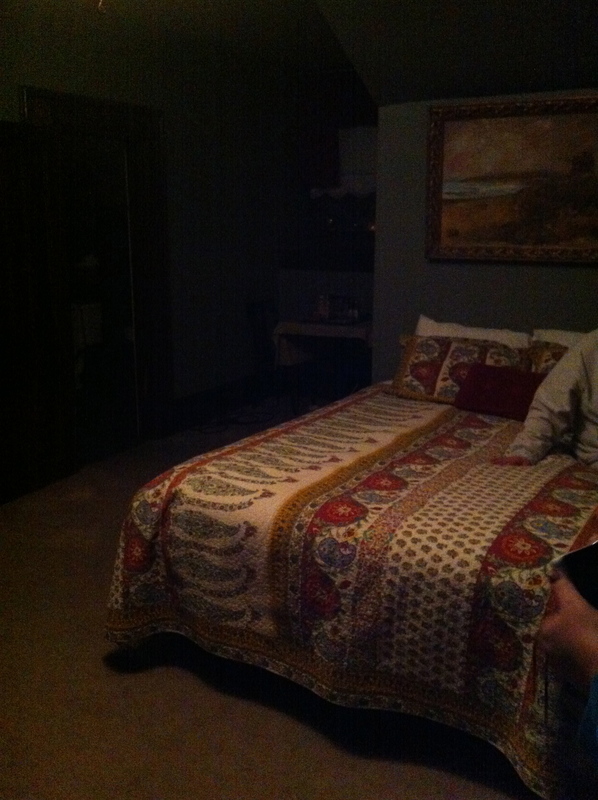 Charles, one of the middle brothers in the Lemp family, lived in this room after traveling around the world. The room is slightly larger than a standard hotel room and is lavishly decorated with turn of the century furniture. The table in the back corner of the room is one of 2 original items in the entire mansion. 1:12 PM: I unpack and then explore the mansion in the daylight. None of the other guests have checked in yet, so all the rooms are open. 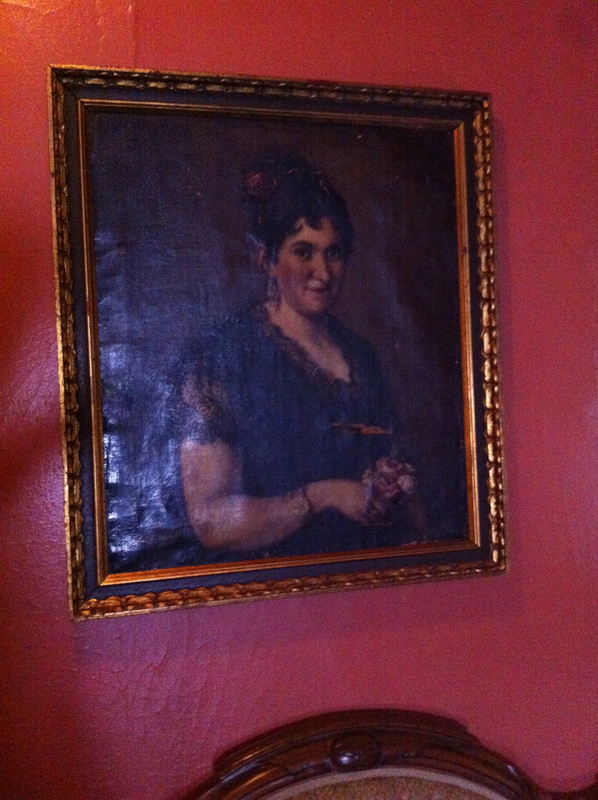 I am drawn to the Lavender Suite, also on the second floor, which has numerous paintings of the Lemp family. This is the site of one of 3 suicides that took place in the mansion. 7:00 PM: I return to the mansion after watching the Cardinal’s Opening Day game at the new business school building. Every Monday, a woman by the name of Betsy Burnett-Belanger conducts ghost tours of the mansion at 7 PM. Lucky for me, it was a Monday night at 7PM, so I decide to go on the tour. 7:45 PM: After describing the long history of the mansion and the various suicides, Betsy attempts to communicate with the dead for the first time. She uses a device called a dousing rod, which can give yes or no answers. The spirit of Billy Lemp apparently responded to her call but decided not to answer any further questions. Disappointing, but the night is young. Very creepy picture. Her eyes seem to always follow you. 8:08 PM: After the very lengthy introduction, we finally begin the tour of the mansion. Starting in the office. Is that red light an orb of demonic energy or is it just the lighting? 8:45 PM: Moving on to the second floor, we enter my room with my permission. Betsy then tells the stories of ghost sightings in the room. The most memorable is a woman who thought she was snuggling with her dog at home only to wake up and realize she was in the hotel. The dog must have been the ghost of the Lemp’s dog because there was no evidence of a dog in the hotel and the mansion has a strict no pets policy. 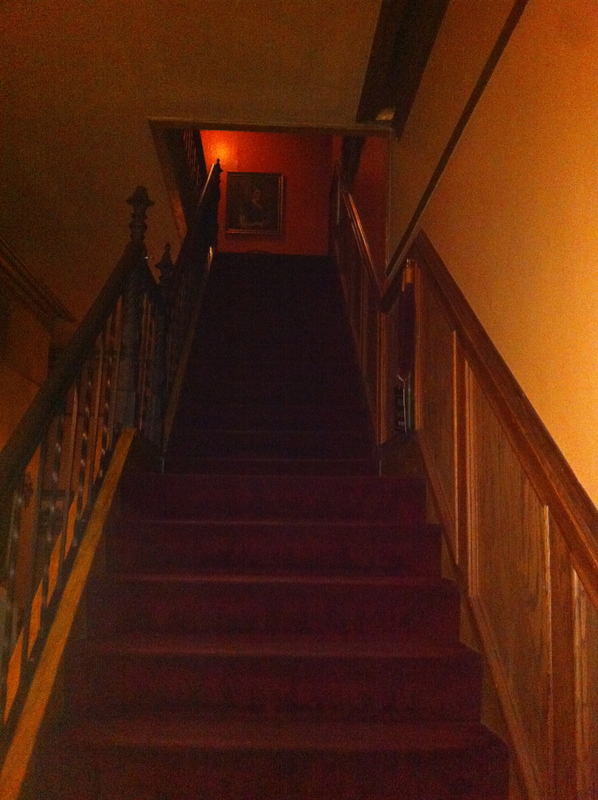 9:20 PM: We arrive on the third floor, the most haunted part of the mansion. Betsy tells us to move to one corner of one of the bedrooms as she turns off the lights. We then attempt to communicate with the dead spirits that dwell on the third floor. 9:21 PM: Betsy dims the lights and tells everyone to turn off their cameras as we search for spirits. 9:22 PM: All of a sudden, Betsy claims to see the spirit of the dog, Serva, walk into the room. While I don’t see a ghost, I do notice a small gray cloud creep into the room and in front of the bed. Betsy is now frantically calling the dog’s spirit cloud towards her, but it wants nothing to do with her and quickly moves onto the bed. Betsy asks “Can you see it?”. She then calls the dog, “Here here here! Come on, Serva! Good job, girl” Then suddenly, the cloud disappears. The bedroom on the third floor where we called the spirit. The dog walked in front of the bed. 9:25 PM: Betsy, unable to contact any more spirits, decides to turn on the lights again. 9:45 PM: We then proceed into the gift shop where Betsy starts to clean up. At this time we all compare pictures from the tour. One person took two pictures of the main stairwell. One picture has a streak of light on one of the walls, which he believes is a spirit. 10:03 PM: We then get to tour the cellar, which Betsy claims is normally off limits. 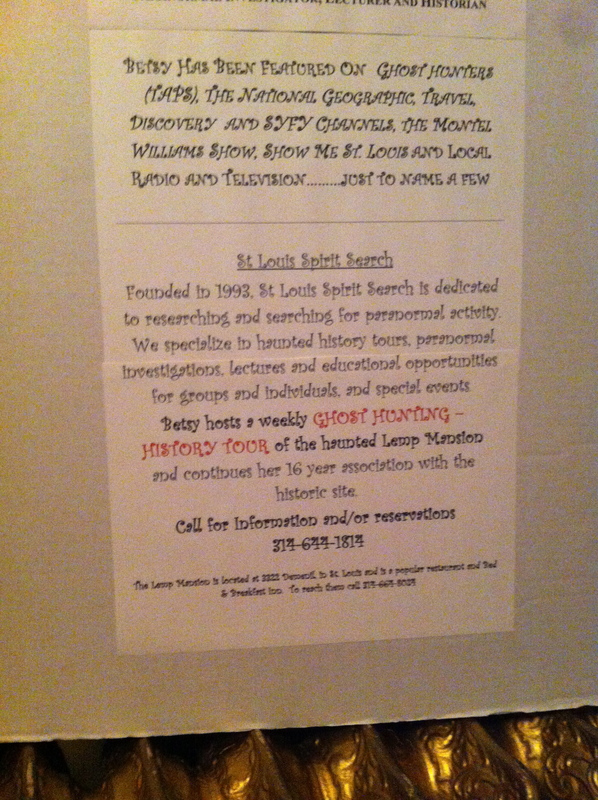 The basement hosts a weekly murder mystery dinner but otherwise is unused. In the back of one of the rooms, there is another door that leads to a staircase, which leads into a brick wall. The brick wall is the sealed entrance to the St. Louis cave network that extends underneath much of the Benton Park neighborhood. 10:08 PM: Betsy then leaves through the mansion through a door in the cellar. 10:30 PM: After saying goodbye to everyone else on the tour, I retreat to my room. The bed is extremely soft and I immediately fall asleep. 1:38 AM: I wake up suddenly and search the room. No spirits. After 10 or so minutes, I fall back asleep. 7:00 AM: The sun rises through my window waking me up. I survived the night. Did I really see the spirit of a dog on the third floor? Hard to say. While I definitely saw a slight haziness in the area Betsy was describing, the spirit could very well be my imagination since she spent 2 ½ hours setting up this situation. At this point, everyone on the tour, including myself, genuinely wanted to see a spirit. When asked to look for some movement in the dim room, it was very likely that we were willing to accept anything as a “disturbance”. Regardless of whether or not we really saw a spirit, the tour was fantastic and certainly the most entertainment you can get for $20 on a Monday night in St. Louis.